The most exciting part about summer in New York City is actually getting outside of New York City. So instead of parking yourself in front of whatever free AC units you can take advantage of, head to Upstate New York, where you’ll find waterfalls, swimming holes, and even a Renaissance Festival. You don’t need to buy a ticket to Napa to get your wine fix, because New York state is home to one of the best wine regions in the world. 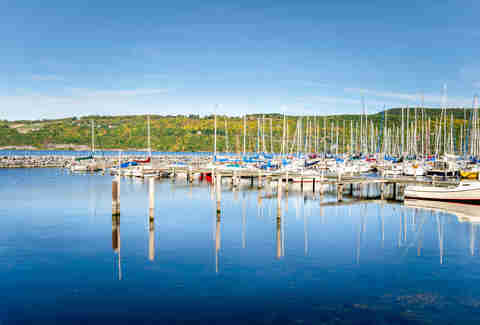 Located in Central New York, the Finger Lakes offer up dozens of wineries with picturesque lake views, plus quaint B&Bs and several summer festivals -- making it an ideal destination for a quick weekend getaway. Plan your trip around the annual Cheese Festival on July 22 to round out your wine-filled weekend. 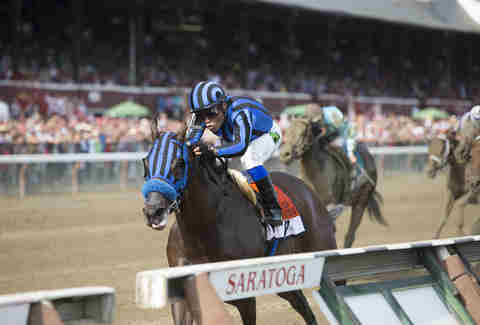 The oldest thoroughbred horse race in North America and one of the biggest events in Saratoga Springs all year, the Travers Stakes, will take place for the 148th year on August 26. Also known as the “Mid-Summer Derby,” the Travers Stakes ranks third in the nation for three-year-old horses, just behind the Kentucky Derby and the Belmont Stakes. There will be a weeklong festival leading up to the big event, including a wine tasting, live music, parties, and restaurant specials all week long. Forget the old adage that TLC made up. 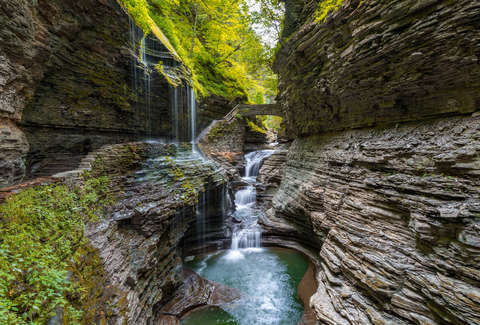 Upstate New York boasts some pretty gorgeous waterfalls that are well worth the chase. Take a trip to Chittenango State Park in Central NY to see the cascading 167-foot Chittenango Falls, hike up High Gorge Falls on Whiteface Mountain in Lake Placid, and don’t forget about the main attraction, Niagara Falls, located in Western New York. Take a trip down to the Cave of the Winds and prepare to get drenched by the Falls as you stand on the wooden Hurricane Deck. If you have a passport, you can hop over the border to the Canadian side of Niagara and treat yourself to a helicopter ride to get some amazing aerial views. 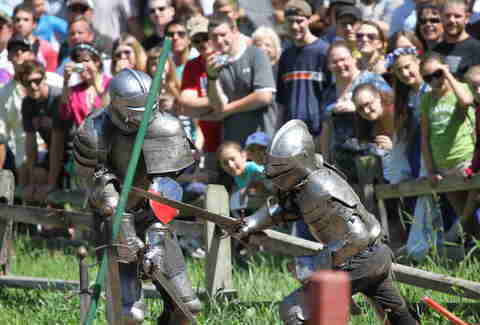 Jousting, Medieval jargon, corsets and kilts, beer steins filled to the brim, and giant turkey legs are just a few of the attractions at the Sterling Renaissance Festival, which takes place July 1 -- August 13. For over 40 years, the tiny town of Sterling, NY has transformed into 1585 Warwick, England for about two weeks of the summer. Attendees get the opportunity to have tea with “Queen Elizabeth I,” attend a royal feast, or go on a pub crawl. Elizabethan street performers, dueling knights, and a large artisan market also await. There’s no need to travel out west to fulfill your dreams of living like a cowboy. Upstate New York is home to several dude ranches, where you can spend your time horseback riding, herding cattle, fishing, and stargazing in the evening around a bonfire. Stony Creek Ranch Resort located in the Adirondack Mountains offers cabins and all-inclusive packages to experience cowboy life just a few hours away from NYC. Why fight the masses at an overcrowded beach or public pool when you have the option of cooling off in a natural lagoon tucked away in many of Upstate NY’s wooded areas? There’s no better way to cool off after a hike than by jumping into the natural swimming pool at Stony Brook State Park, enjoying the natural swimming area just below a waterfall at Robert H. Treman State Park in Ithaca, or wading in the shallow cool waters at Millstream swimming hole in Woodstock. The Erie Canal has been considered one of the most important man-made waterways in North America since it was built in 1825. 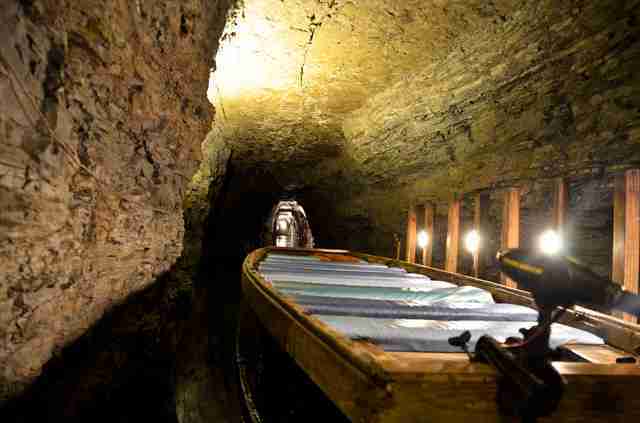 Learn more about the civil engineering marvel by heading to the city of Lockport (about 30 minutes from Niagara Falls) and going underground with Lockport Cave & Underground Boat Rides. While underground, you’ll see artifacts left by miners from when the canal was constructed, as well as a 1600-foot water tunnel. Then take a 20-minute drive to Buffalo and go on a boat tour with Buffalo River History Tours to discover how the Erie Canal made Buffalo one of the most important industrial cities and largest malt producers in the United States during the 20th century. The tour includes a ride through Elevator Alley, the largest collection of grain elevators in the world, where you can walk through an abandoned malting factory dating back to the early 1900s. New York state is full of military history, ranging from museums and memorials, to the renowned military academy, West Point, but there’s no better way to learn about our storied past than by going to a reenactment. History comes alive at Old Fort Niagara, which hosts buildings dating back to the 1700s and puts on several war reenactments throughout the summer, including a reenactment of the French and Indian War from July 1-3. You can also head up to the Thousand Islands and watch reenactments of the War of 1812 at Sackets Harbor Battlefield on July 8. Letchworth State Park is known to be the “Grand Canyon of the East” due to the large 550-foot gorge carved by the Genesee River. 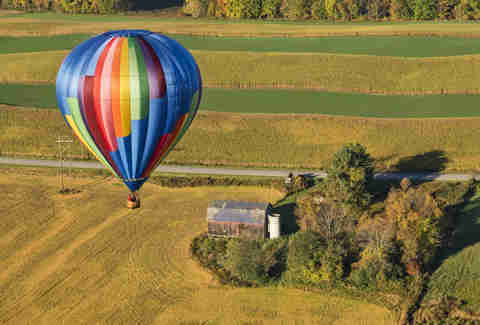 While visitors can go the more traditional route of seeing Letchworth’s impressive landscape by hiking through the gorge, many opt to take a hot air balloon ride to experience the park’s scenic views from high above. Campsites, horse and bike trails, whitewater rafting, and kayaking are also available at Letchworth. 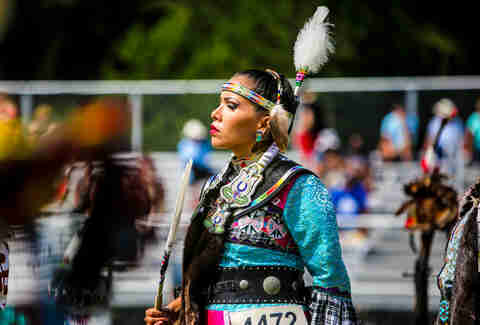 New York state is home to one of the nation’s largest gatherings of Native American dance and celebrations in North America: the annual Marvin “Joe” Curry Veterans Pow Wow, set to take place July 14-16 in Salamanca. While the pow-wow is hosted by the Seneca Nation of Indians, Native Americans from all over the United States and Canada will be in attendance, showcasing the diverse Indigenous American culture. Attendees will be able to experience and learn about Native American music, dance, food, and art. 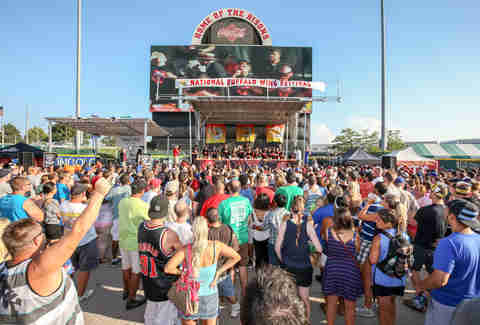 End the summer on a hot note by heading to Buffalo to partake in a festival dedicated to all things wings. Buffalo’s culinary gift to the world is celebrated on Labor Day weekend with tons of events, including a 5K race, a chicken wing eating contest, live music, food & wine pairings, and of course, a whole lot of chicken wings. Dozens of restaurants hailing from as far as Australia will serve up over 100 different varieties of the popular bar snack, including those doused in traditional Frank’s hot sauce, maple bacon seasoning, or even peanut butter and jelly flavoring. Caroline King is a writer based in Buffalo, NY. Her favorite summer activities include patio drinking, never having to change out of her swimsuit, and remembering to re-apply sunscreen. Follow her on Twitter, or check out her travel blog.